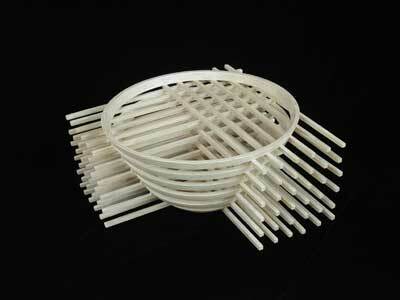 A constructed sculptural vessel made from segmented and turned rings and square section grid elements. The material is bleached oak, lacquer finish. I am interested in the transformation and contrasts discovered through woodturning. The process of converting a featureless block of wood into a graceful, symmetrical form is always fascinating and full of surprises. While working at the lathe, all the details and color of the object are integrated into a spinning blur that reveals only its outline. At rest, the same object can disclose complex details and dramatic coloring while possessing an entirely different sense of motion.